Who else ate bacon today? Discussion in 'Beer & Food' started by I Are Baboon, Aug 24, 2005. I had eight strips this morning, courtesy of a free catered department breakfast. Free bacon at work is a rare treat. I hope the rest of the day goes this well. not yet but i'm sure i will. i eat bacon almost every day that i am at work. i have to cook it, so i'm gonna eat it. Sorry, this is the "Yes I did eat bacon today" thread. bacon is a sometime weekend treat for me. That's a fine idea. You've inspired me, IAB, I will be cooking up bacon for lunch after I run a couple errands. Grilled cheese with bacon - with a side of bacon, of course! No bacon for me today. Maybe I'll make some pasta sauce with the chunk of Canadian bacon in my fridge tonight. I'm having bacon right now ... on a Big Ygrilled turkey panini. Mmmmmm. had a chicken, bacon, olive wrap w/ ranch dressing for lunch. thanks for the prompt, IAB! Glad to see other monkeys enjoying all that is bacon today. 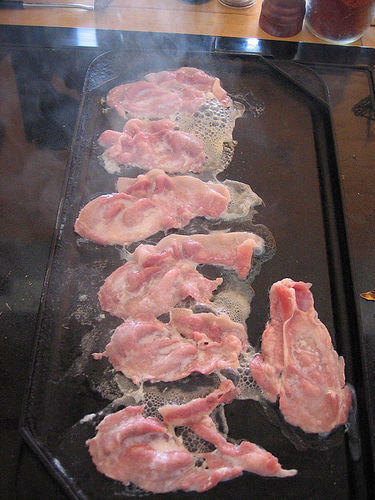 in about 5 minutes i'll have about 6 rashers sitting right in front of me freshly grilled and ready for consumption. I cooked up some bacon, put it on a tuna sandwich, put a couple pieces of cheese on it, and grilled it up. It was delicious! i ate bacon today. lots of it. i didn't even put it on anything. i just gobbled it up. i have been deprived for way too long. I had a single slice of bacon at a buffet type hotel breakfast last week, I ate at the buffet 5 mornings in a row and avoided the bacon 4 of those days. My self control is scaring me. To make up for it I just wedged the single slice of bacon between my cheek and gums and savored its juicy flavors for hours. I always said if I could make one food good for you, it would be bacon. You can eat it with every meal!!! Have you ever tried pancetta? I got BACON last night for dinner. You don't qualify. Ham is not bacon. Do you consider pancetta bacon? yes, because you don't eat it out of the package uncooked. unlike ham, canadian bacon, or proscuitto. Why are you being difficult? Just eat some goddamn bacon. That's why I used Canadian bacon in my carbonarra. How can you take anything seriously when it's named after America Jr.? Tru dat. Especially the way you seem to like to 'cook' (read: totally overcook) it. Meat shouldn't crunch. Or be 50% fat before you start. Ehhhh...you are a bacon snob? I didn't realize such a thing existed. S.S. can be snobbish about anything. I bet he breathes better air than you. I find most American bacon to be way too salty. Well, duh. Why do you think J. Denver always talked about "Rocky Mt. High"? don't get me started on what the irish and english term "bacon". it's ham, w/ a squiggly little under-cooked rasher off the back of it. Nope. 'Merikan bacon is inferior. Although the grease from it sure does make a tasty addition to many dishes. dude, that's not bacon. that's fried calves' brains.